Today I've decided to do a "What's on my iPhone" blog post, I myself enjoy watching these videos on YouTube and decided to do a slightly different version of it. 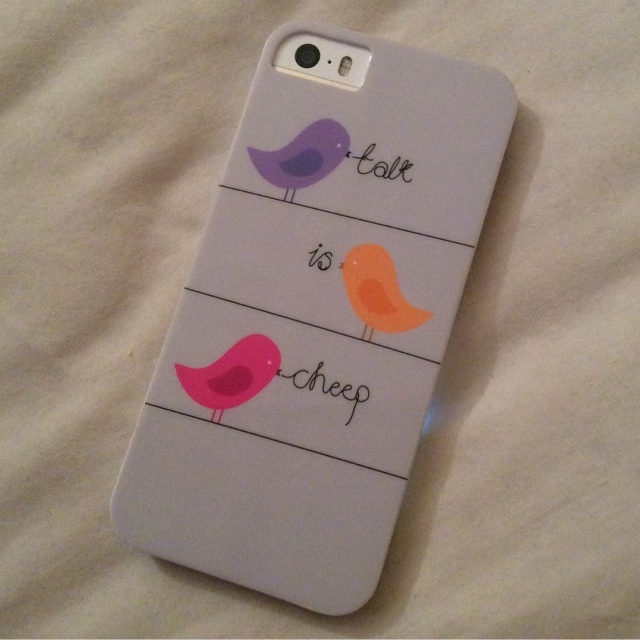 I've got the iPhone 5s in White and Gold, and the case I have on it at the moment is just a white case with 3 little birds saying "talk is cheep". 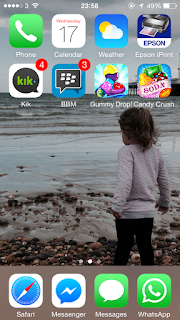 My background picture is of my youngest niece looking out at the sea with the Brighton Pier in the background. So firstly throughout this post, you will see that I've split my phone into three different screens. The first screen being what i use on a daily basis, the second screen on what i use every now and then, and then the third screen is all my different folders separated into different sections. I wont go into full detail on the third screen, I will just pick out a few apps to tell you about out of each folder, otherwise i would be here for ages haha. So on the first screen i have Facebook, Instagram, Twitter, these three apps i use throughout the day. Then i have Snapchat, Mail, Photos, Camera and PuddingCam.....PuddingCam I prefer to use rather than the actual camera that comes with the iPhone, as the pictures come out so much nicer although the app is a bit slow now as theres no updates avaliable anymore as the app is no longer on the iTunes app store :(.....not that i can find anyway, if its is and is under a different name then please let me know in the comments below. Then onto the second screen, i have Phone, Calender and Weather, which are just the basic ones that come already installed on the iPhone. I then have Epson iPrint which means i can print straight from my phone, which i love as it saves me getting the laptop out if i say want to print out an email quickly for example. 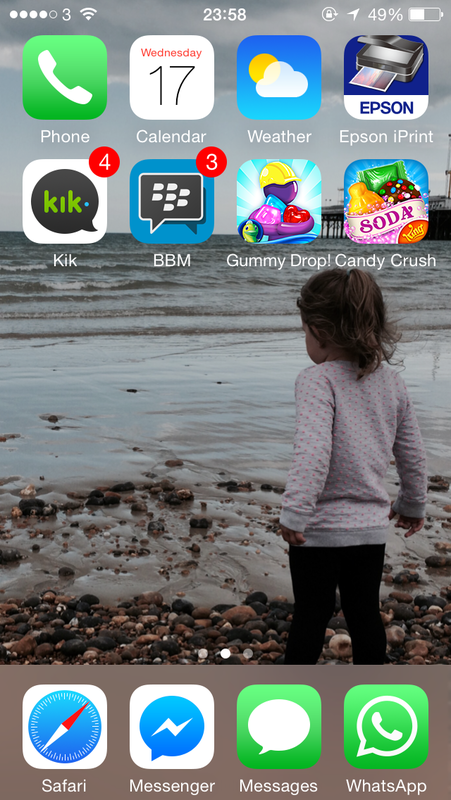 I then have Kik and BBM and two games Gummy Drop and Candy Crush, which i play most days when i'm bored. And then I just have the four basic apps at the bottom which are Safari, Messenger (facebook), Messages and WhatsApp. 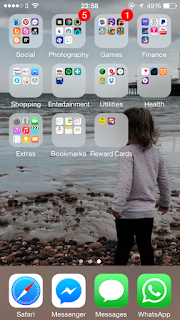 Then onto the third screen i have quite a few folders which are: Social, Photography, Games, Finance, Shopping, Entertainment, Utilities, Healthy, Extras, Bookmarks and Reward Cards. 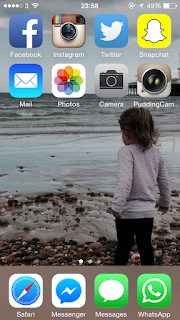 In the Social folder, the three apps i mainly use are Pinterest, Blogger and Bloglovin. I'm addicted to Pinterest and sometimes go on there for like 5 minutes just to have a quick look, then realize I've been on there for about an hour without even knowing lol. 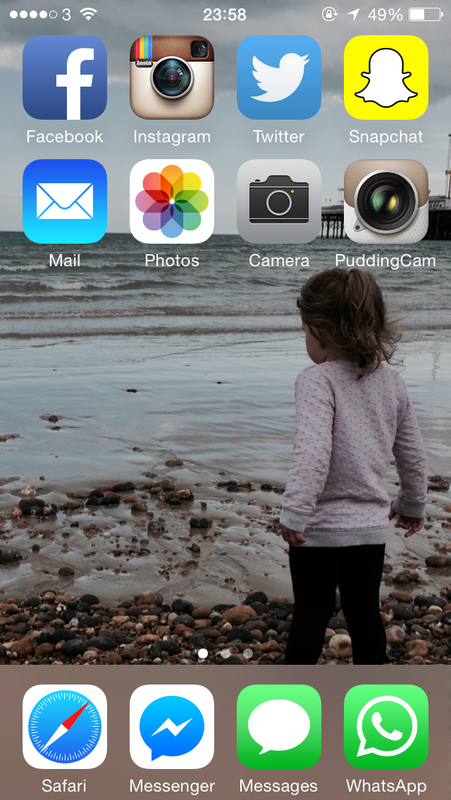 In the Photography folder, the ones i mainly use are Picfx, VSCOcam, PS Express, Layout and sometimes Squareready. In the Games folder, I only really use Tiny Tower Vegas and Kim Kardashian: Hollywood, and i only really use those two games when I've really got nothing better to do.....so usually of a night time before i go to sleep. 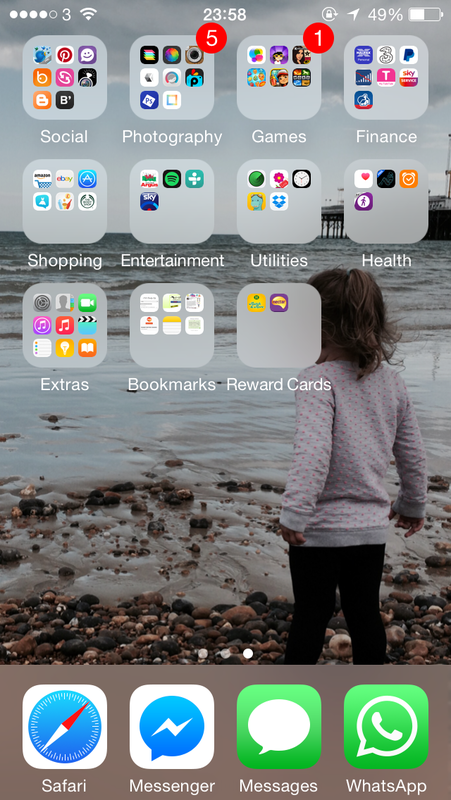 The next folder is Finance which is just basically my banking, tv and broadband apps and my mobile network app. Pretty self explanatory really. I then have the Shopping and Entertainment folders which are just your usual apps like Amazon, eBay, Vinted, and TheBodyShop, and in entertainment Spotify. The Vinted app is where you can sell all the clothes that you dont wear, or don't like at cheap prices. I've brought and sold quite a few bits through this website. Then Utilities, Healthy, Extras and Bookmarks are either apps that are pre-installed on the iPhone that i cant delete :( or are ones that i rarely use but for some reason just wont delete them! (do any of you have apps like that, that may one day come in useful so you wont delete them?). And then the last folder is Reward Cards, and these two are just for supermarkets that i use the most. So i have the Morrisons Match & More Card, and the Sainburys Nectar Card. 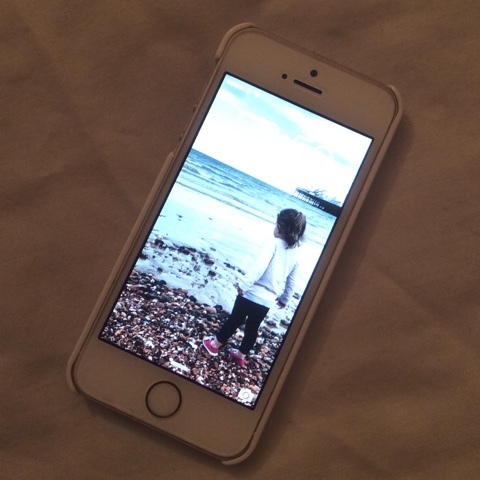 So there we go, I've done the "What's On My iPhone 5s" blog post, hopefully you stuck around long enough to read all of it and i didn't go on for too long :-). If there's any apps that i haven't got and you would recommend them, then please do let me know in the comments below.